Gronkowski still undecided on whether to continue playing or retire from the NFL. For the past few days, New England Patriots head coach Bill Belichick has been on the scouting trail, taking a closer look at players who they might take in the 2018 NFL Draft. Belichick made his first stop at NC State’s pro day before traveling to the University of South Carolina to personally see how one of its prospects perform before scouts. According to WEEI.com, Belichick is interested in South Carolina tight end Hayden Hurst who is considered one of the better tight ends in the 2018 NFL Draft. Belichick met with Hurst during South Carolina’s pro day on Monday. Before that, Hurst revealed that he had a chance to meet with Belichick during the NFL Scouting Combine. The Patriots’ tight end situation is unclear, with Rob Gronkowski still undecided on whether to continue playing or retire. At 6-foot-5 and 250 pounds, Hurst has physical features and athleticism similar to Gronkowski. The Gronkowski situation has forced Belichick to look into the tight end market and the possibility of taking one in the upcoming Draft. Last season, the 25-year-old Hurst tallied 44 receptions for 559 yards and two touchdowns in his junior year with the Gamecocks. Hurst also carried the ball nine times for 30 yards and a touchdown. Hurst finished his career with the Gamecocks with 100 catches for 1,281 yards and three scores. The Patriots could use their second-round or late pick to take Hurst. Aside from Hurst, Belichick also met with South Carolina linebacker Skai Moore, who led the Gamecocks in tackles in each of his four seasons with the team. “We were just talking about life, football, my career here,” said Moore, who is expected to be a late-round or undrafted option for the Patriots. Will Brinson of CBS Sports spotted Belichick during North Carolina State’s pro day, where some of its prospects showed their ability to scouts and coaches. The top prospects from NC State include defensive end Bradley Chubb, defensive tackles B.J. Hill, Kentavius Street and Justin Jones, running backs Nyheim Hines and Jaylen Samuels, offensive tackle Will Richardson and guard Tony Adams. The Patriots will take No. 31 in the first round, so they don’t have a chance at taking Chubb, who is expected to be taken in the top half of the opening round. 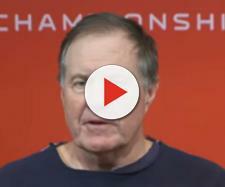 However, this didn’t stop Belichick from meeting with Chubb. With Dion Lewis gone, the Patriots could also take a look at Samuels, considered one of the versatile prospects in the Draft as he played tight end, running back and slot receiver at college.